Her son Imre, anxious for her to see the places where she’d lived as a girl, nagged her into making the trip. This is not a Holocaust story. It’s not about someone visiting a death camp where she miraculously survived. No. This is about Poland: what it was then and what it is now. It’s about a woman–a Jewish woman–who left before World War II and, after many decades, returned for the first time. It’s also about memory: how it shapes who we are. If a world vanishes, is memory all that remains? Does a culture’s total disappearance place a special burden on those who remember? Do those who remember become… what? Keepers of Memory? In a sense, that’s what Genia became after leaving Poland in the late 1930s as a teen-ager: a Keeper of Memory. She kept her memories alive during the thirty-five years she lived in Argentina, bringing up two children, one of whom is my wife Betty. And she’s kept those memories alive during the last forty years, while living in Israel. Her memories of Poland of the 1920s and 1930s are mixed. She remembers with nostalgia her life in a small town in Galicia (southeastern Poland): the house, her parents, grandparents, the wood stove with its smells of chicken soup and fresh-baked poppy-seed cakes, the tile heater in the den, friends and neighbors … all memories bathed in warmth. A week before going to Ulanow, the small Galician town where Genia was born and brought up, the five of us–Genia, Imre, his wife Rosita, Betty, and I–rendezvous in Warsaw, which, for Genia, has its own bitter echoes: She spent a year there when she was fourteen, attending a Jewish high school. She’s brought maps with her and lays them out on the kitchen table of the apartment we’ve rented. It’s clear that the house in Ulanow has taken on mythic qualities: It’s where everything was perfect. Where she was nurtured by people who loved her. The five of us go to the neighborhood in Warsaw where Genia lived for a year and where the infamous ghetto would later be. There’s no vestige of the ghetto, but there is a kind of park, with overgrown weeds and untended stretches of shrubs. All around are Communist-era apartment houses, shoddily built: balconies with exposed metal bars and crumbling concrete. In the park, there’s a memorial to those who carried out the ghetto uprising and were murdered by the Nazis. A carved stone homage has remnants of old posters that have been sloppily scraped off, leaving small, stuck pieces behind. In this park, and around it, there are no Jews now, only Poles taking in the unkempt greenery. Later that day, we find ourselves in a Warsaw tourist section called Barbican, where curio/souvenir salesmen hawk Barbie-sized wooden dolls. One kiosk sells dolls with Jewish motif: Hasidic figures, klezmer musicians, dancing rabbis. One wooden marionette is a grotesque caricature: a religious Jew greedily counting gold pieces. We’re astounded. After all, it’s been a generation that Poland’s been subject to Western influence and it’s a member of the European Union. We wonder, whom do they sell this doll to? Today not a single Jew lives in the town of Lezajsk. Before starting out on this trip, we had surfed the net and investigated several options about where to stay in Galicia. Most promising was a castle in Baranow Sandomierski. The photos looked interesting, and the accompanying info mentioned that there were several rooms in the castle, plus a modern hotel. By the time we arrive at the castle, it’s well past 10 p.m. The parking lot is empty, no lights on. It seems abandoned. We knock on the medieval gate. The caretaker, stooped and shifty-eyed–let’s call him, oh, Igor–opens the gate with an enormous wrought iron key. He leads us to two suites that are a mixture of Middle Ages and modern: old chandeliers in the bedrooms … and Jacuzzis in the bathrooms. Betty and I–and Imre and Rosita–are excited about this once-in-a-lifetime experience. But when “Igor” shows Genia her room–the “Presidential Suite”–she’s horrified. Too big. Too plush. Too many echoes of Dracula movies. We urge “Igor” to find a room for Genia at the hotel, less than one hundred yards away. It’s a Motel 6-type room, and Genia’s delighted. In the morning, I leaf through a magazine for English-speaking tourists. An article talks about an annual pilgrimage–going on nowadays–in the town of Lezajsk, where a famous eighteenth-century rabbi, Elimelech, is buried. Every year, for one week, Hasidim–ultra-Orthodox Jews–come to the cemetery to pray and pay homage. 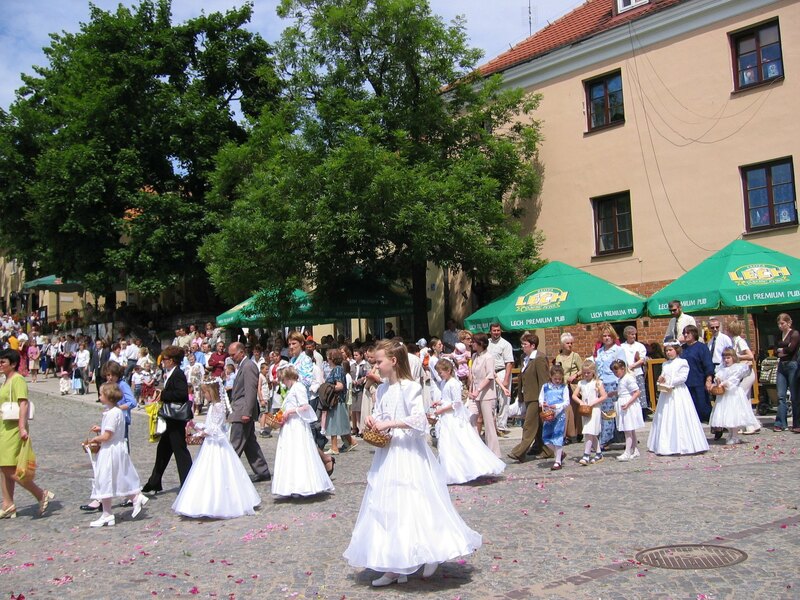 It isn’t the right time of year to see the pilgrimage, but we go to Lezajsk anyway. Inside the cemetery, we visit the tomb of Elimelech, which is in a small building of its own, an honored place. When Elimelech is happy, goes the old song, he calls for fiddlers and drums and dancing. The caretaker, a middle-aged Catholic woman, complains about the Hasidim who come here every February. “Those people in black never give me anything,” she says, “not even a zloty.” We give her some coins … to show her, I suppose, that we aren’t as cheap as the Hasidim. I look around at the gravestones and try to imagine what the annual Hasidic pilgrimage is like. Middle of winter. Snow. Cold. They’d be dressed in heavy clothing. Around the little structure that houses the grave, they’d pray and dance and sing, their hats bouncing, their forelocks swaying. A disappeared past made flesh for a few days each year. Yes, for the Poles it would seem like a strange dream. 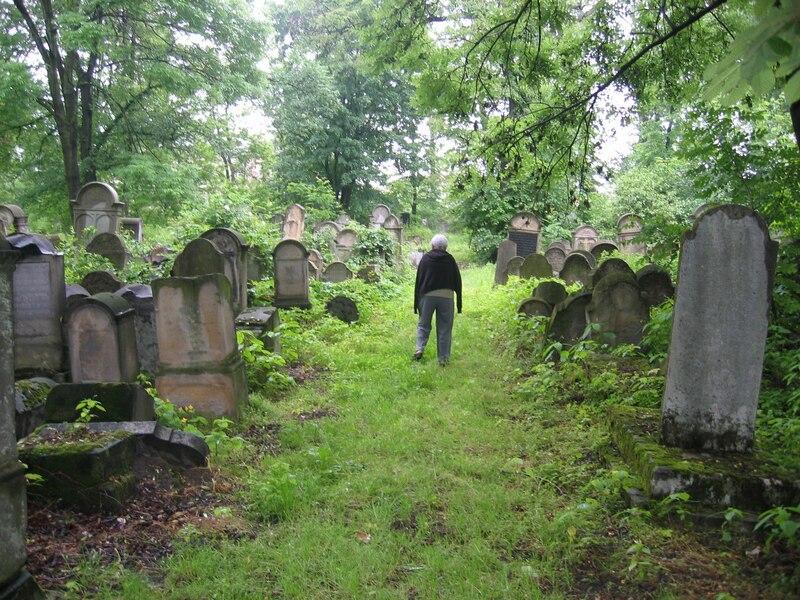 Lezajsk is our first cemetery experience, but not our last. During the next few days, in village after village, we find ourselves inevitably drawn to other cemeteries. In some cases, they’re overgrown, defaced, looted. In some, the gravestones have been (let us say) recycled, forming part of a wall or walkway. Some graveyards have become ad hoc playgrounds at the edge of town, with kids riding bicycles in between gravestones. Day after day, it’s the cemeteries that draw us in and hold our attention. Peaceful, evocative, mile-markers on the road of history, they jolt our hearts and our imagination–and isn’t that the purpose of traveling? Day after day, it’s the cemeteries that draw us in and hold our attention. A zone of quietness descends. On the outskirts of Tarnow, a handsome city filled with old buildings and winding pedestrian streets, we see a brick wall that encloses a large space. We look beyond it and see no crosses or flowers inside. So we drive around and finally locate a dead-end street with a wrought-iron gate we can look through: gravestones with Hebrew writing and Stars of David. Exactly what we were hoping for. We try to open the gate, but it’s locked. A few seconds later a woman comes out of the house across the street. She’s about forty, with the dyed maroon hair that’s in vogue in Eastern Europe. She speaks with Genia in Polish, then gives us a large key with a leather thong. She tells us to lock ourselves inside. Otherwise, local hooligans might go in and get drunk. And maybe deface the tombstones. We follow orders and lock ourselves in. We walk slowly through the sizable grounds, which are weedy and disheveled. The gravestones, though, are largely intact. We read the headstones out loud, slowly, giving full weight to the lives they honor. A “beloved father,” a “cherished grandfather,” a “mother we will miss.” Everyone was pure and honorable. Not one tombstone tries to communicate a complex, ambiguous reality, which surely it must have been. Every homage gives a glimpse into the way we like to see ourselves. But there’s something else. This plot is virtually the only legacy of a community that once lived here: where children studied and ate and prayed and laughed and grew up … and eventually had children of their own. Full lives. Triumphs and tragedies. And, in the end, they left almost nothing except these stone markers. The feeling is overwhelming, as if a zone of quietness descends upon us. We stay there for hours, hardly talking with one another. When we go out, we return the key to the woman caretaker and offer her a handful of zlotys for her trouble. She refuses to take the money. We insist, but she’s adamant: She won’t accept it, period. She tells us that people come from all over the world, several times a week, to visit this place. Sometimes they come to search for family members. Sometimes they find a relative’s gravestone. That’s her reward, she says. It’s Corpus Christi Day, a national holiday in this devout Catholic country where you can’t drive a kilometer without seeing a shrine to the Virgin Mary. At the center of Sandomierz, a lovely medieval town, there’s an enormous procession taking place: priests, nuns, townsfolk, community leaders, all dressed in their finest. There are middle-aged men in tuxes and bow ties, young men in black cassocks and white tunics, older prelates in purple, men and women in medieval garb. Teenage girls in communion dresses and white garlands strew flower petals. Everyone in town is involved–everyone–and they all chant as the procession wends toward the central plaza. Then they all participate in communal prayer. We’re probably the only non-Poles at this ceremony, and people look at us as if we’re invading their privacy. They may not know we’re Jewish, but they know we don’t belong here. We walk a couple of blocks. Genia points out that the name of the street we’re on, in Polish, is “Jewish Road.” At the end of it, there’s a building that was once a synagogue. It now houses the town’s archives: one set of memories replaced by another. In this town, as in others in Poland, Jewish life and culture are like a palimpsest, a document that has been erased and written over, leaving the original nearly invisible. In the nearby town of Nisko, we find the “gymnasium” (high school) that Genia attended for three years. The building is still used as a school. As we walk around, we see fresh graffiti on a side wall: Jude raus (Jew, get out, in German). The “u” in Jude is a Star of David. As far as we know, there are no Jews left in Nisko, nor in any other towns in this area. What could that graffiti mean, and why is it in German? As we search, a woman in her late seventies comes out of a house and Genia asks about people and houses. The woman says that most of the town was destroyed in the fighting between Germans and Russians. She says, smiling, that during the war, the Germans were in charge and things were OK. Then the Russians were in charge, and things were OK then as well. She and her husband–Krzystina and Henryk–survived it all. Krzystina invites us in for coffee and cookies, and we join them in their backyard. Though the conversation’s in Polish, we realize that Genia says that Betty and I live in Los Angeles (true) and that she, Imre, and Rosita live in Argentina (untrue). Rosita excuses herself and leaves. After twenty minutes, the rest of us thank the couple and go. We’re all chastened by her attitude. Look, she survived, she’s still here; so there! These signs don’t refer to any present reality. They are merely decoration. Motif. Kazimierz was once a Jewish section in Krakow. The area was decimated during World War II, its residents sent to ghettos, then concentration camps, then exterminated. Now, many decades after these events, Kazimierz has risen out of the ashes to celebrate what it once was. There are not only Jewish restaurants but Jewish music, museums, libraries, synagogues, and other tourist sites. At Ariel Restaurant, we’re sitting at an outdoor table, facing the main square. It’s busy. All the restaurants are crowded, people waiting. Buses pull up and disgorge groups of tourists. From inside the restaurant we hear a live klezmer band and a raucous audience that responds, clapping in rhythm with the traditional Jewish music. I can’t see who’s inside, but I can imagine: groups of American Jews enjoying themselves. A few minutes later those who were inside start filing out, group by group. Oddly, they’re German/Spanish/Italian tourists. From what we can tell, none of them are Jewish. We find out that the musicians aren’t Jewish either, and neither are the waiters. As far as we can tell, there are no Jews here, except us. I try to sort it out: in this neighborhood where, until 1940, there was once a large Jewish community and which is now undergoing a rebirth, there are now Jewish restaurants and museums and synagogues, Jewish music and bookstores, Jewish cemeteries and curio shops … but virtually no Jews. It’s like Chinatown … without any Chinese. It gets weirder. At one end of the square there are large signs, the kind used outside of stores in the 1930s: According to the signs, these are small neighborhood shops owned by Chajim Kohan, Aron Weinberg, Benjamin Holcer, etc. But none of these people or stores exist now. These signs don’t refer to any present reality. They are merely decoration. Motif. Look inside the windows and you won’t see a tailor shop or shoemaker or grocery store. You’ll see a slick, modern restaurant/bar where hip, young (Christian) Poles are having drinks and trying to pick each other up. A Jew-themed restaurant in a Jew-themed neighborhood. It is, in a word, grotesque. A block away is a Jewish cemetery where smashed gravestones, gathered after the war, have been formed into a moving collage, a homage to the nearly seventy thousand Jews from this neighborhood who perished: Broken pieces have been put together with cement, making something beautiful and holy out of what was once debris. In this stone collage, the Hebrew words, or parts of words, make no sense. It’s like one of those found poems where you rip apart a piece of paper and put it back together, seeing if in the anarchy of words, some serendipitous phrase pops out. Perhaps this stone collage, this jumble of words and letters, is the best homage one can pay to a disappeared world: who could possibly make sense of the senseless? At last, the climax of our trip: We’re in Ulanow, the town where Genia spent most of her first eighteen years. We walk around the town slowly, starting from the central square. Genia says that the town looks more or less the same as it did eighty years ago, but that the feel of the place is radically different. There are no Jews, of course. Instead, in a front window of every house there are icons of Jesus and the Virgin Mary. We go to the where the synagogue once was. Now, there’s a school. A man in his forties is nearby, working on his bicycle. He smiles at us, so we approach him and ask if he speaks English. He does. His name’s Adam and he’s the English teacher at this school. 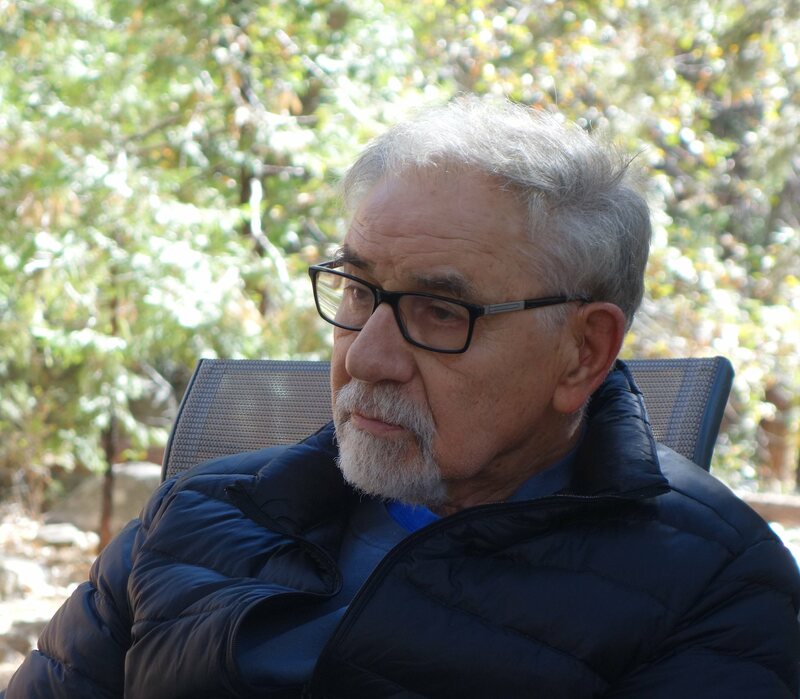 He used to live in Warsaw, but after a divorce he started teaching in small towns. He’s been in Ulanow for a year. We tell him that Genia lived in this town and left in 1938. “So you are Jewish,” he says. “Yes,” says Rosita without hesitation. He tells us that Ulanow’s population, before the war, was two-thirds Jewish. Genia shrugs in quiet understanding: some things never change. We leave the man and walk to the elementary school Genia attended. She seems lost in a memory so deep that it blocks out the present. “When it snowed,” she says, “my sister would walk in front, making tracks, packing down the snow, so I wouldn’t get stuck.” She looks around and tries to orient herself. “It’s that way.” She’s focused, like an animal picking up a scent. We walk for two blocks … and then we find it: The house. The house. 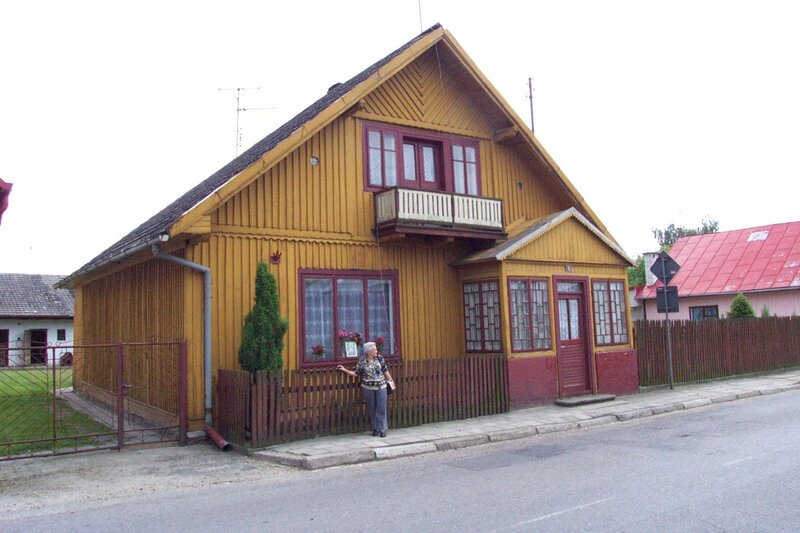 The main reason we’ve come on this journey: so that Genia can see, once more, the yellow wooden house where she was born and where she spent her childhood. Oddly, it hasn’t changed much. One thing has changed: On the windowsill there’s a framed painting of Jesus. Genia knocks and knocks again, but no one comes to the door. For nearly seventy years, she’s thought about this moment. She can hardly breathe. As she looks down the street, memories swirl. Yocheved, her best friend, lived next door with her family, the Susmans. Over there, the Klapers. And that house, the Reich family. Across the street, the Nowackis, the only Christians on the block. Finally, a man comes out. Genia says that she once lived here, before the war. She says that her uncle sold the house, which is coded language: She’s letting the man know that she has no intention of making a claim on this house. The man agrees to let us in. There are two fortyish brothers living there, unmarried, no family. They seem slightly slow-witted. Neither looks as if he works for a living. They tell Genia that the man who bought the house from her family was their grandfather. We don’t tell the two men that a family legend has it that Genia’s uncle sold the house for a pair of shoes. The house is not clean or kept up. Things are thrown around. In the kitchen there’s the wood stove that Genia has talked about as the source of all good things, especially in winter. It’s no longer in use–there’s a gas stove for food preparation–but the old stove is still there, a piece of furniture. We go into the living room. The same tiled heater is there that Genia remembers, though now it’s heated by gas instead of wood. Aside from these slight changes, the house remains eerily the same. Genia points out the corner where she used to sit for hours while her mother read to her, the place where she and her sister would huddle for warmth on cold nights. We urge Genia to ask if we can see her bedroom upstairs, but the men say no: They’re using it for storage. Genia looks toward the steps, lost in a private memory. When we leave, Betty and Rosita each take an arm and guide Genia out, but she seems in control of her emotions. As we go down the street, she looks back one last time. It was at that moment that Genia learned a heartbreaking lesson: that the real danger in going back to Galicia after all these years was not physical but emotional. She had realized that for Keepers of Memory–whether those Keepers are people, neighborhoods, museums, or cemeteries–some memories are better left alone. For nearly seventy years, she’s thought about this moment. She can hardly breathe.